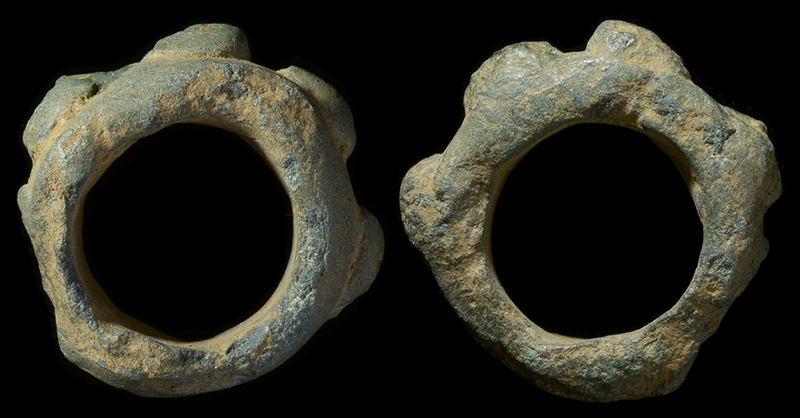 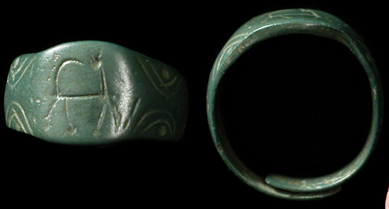 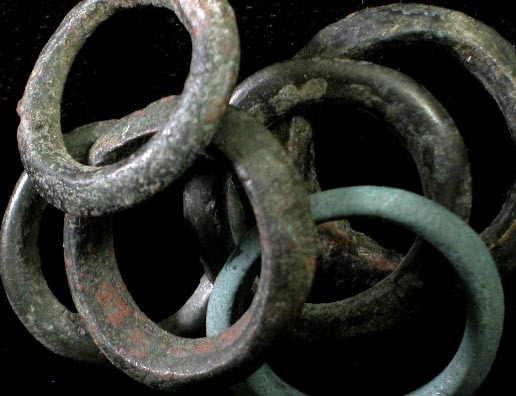 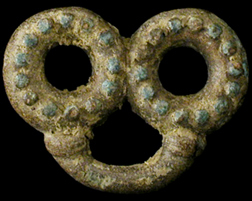 Celtic bronze 'ring-money', 5th - 1st century BC. 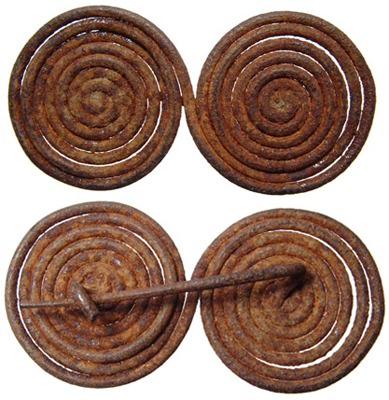 Ancient currency used by the Celtic tribes of Europe as trade and jewelry. 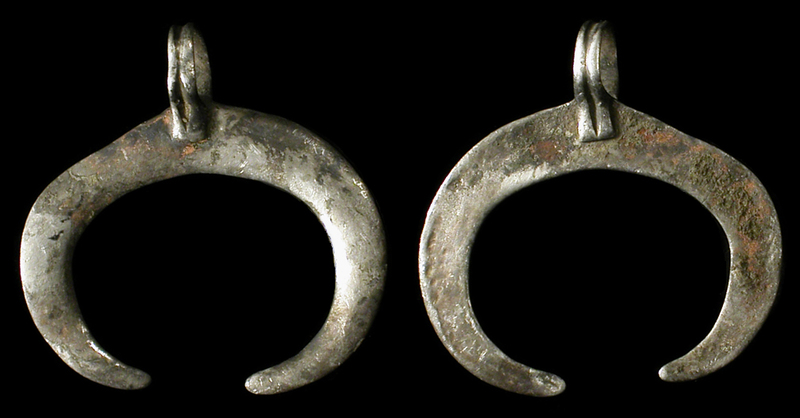 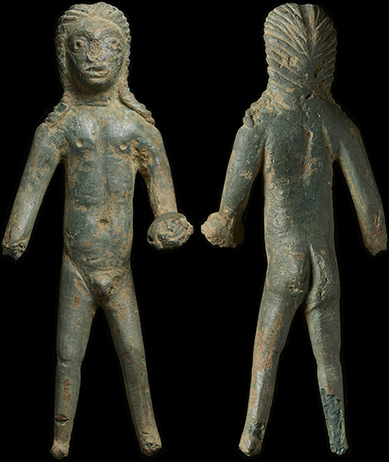 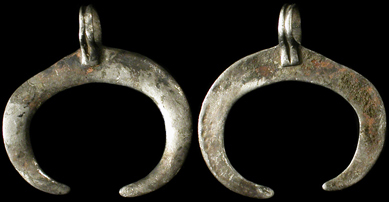 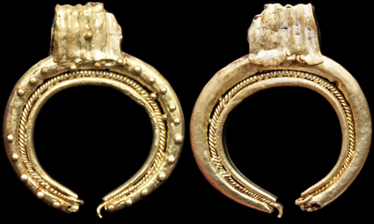 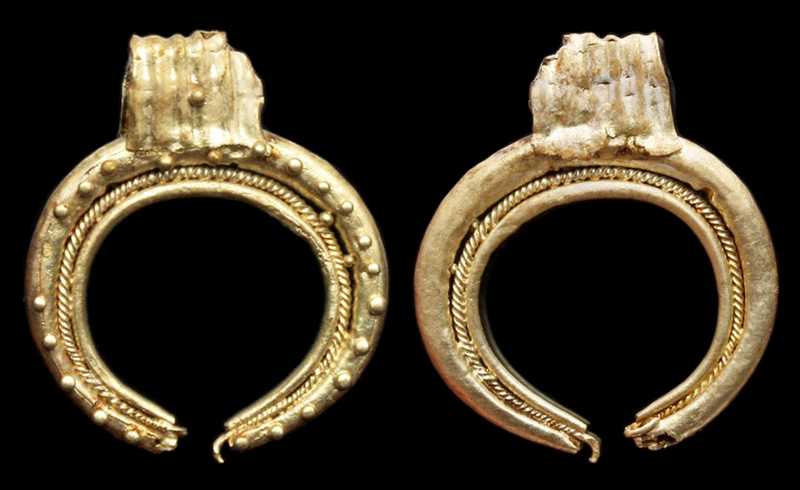 Average size 12 - 23 mm, excavated from Celtic settlements near the Danube River in Eastern Europe. 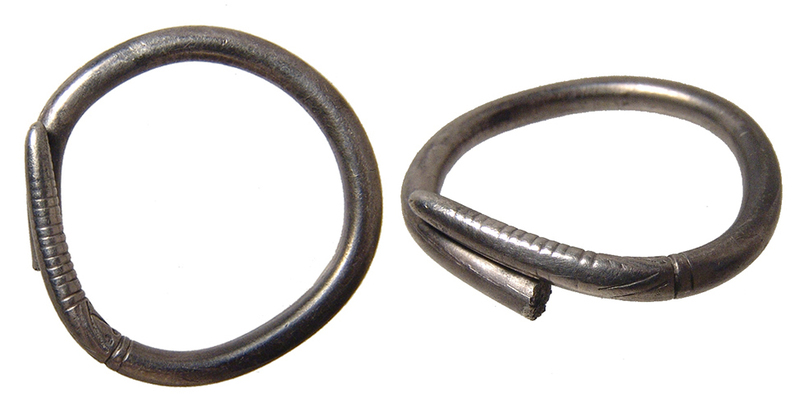 Mostly low-grade, bent and crusty ones left, can be strung on leather necklace for an additional $10. 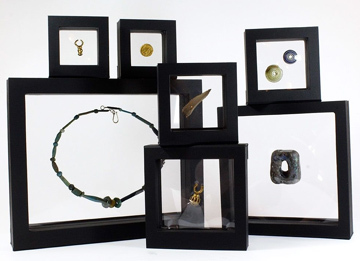 The perfect display frames for Celtic Artifacts! 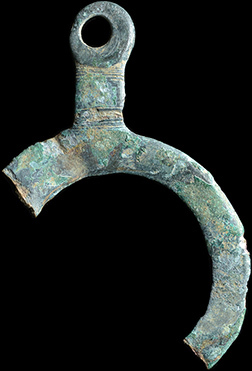 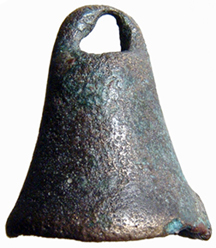 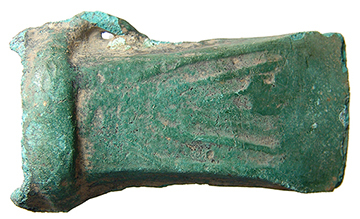 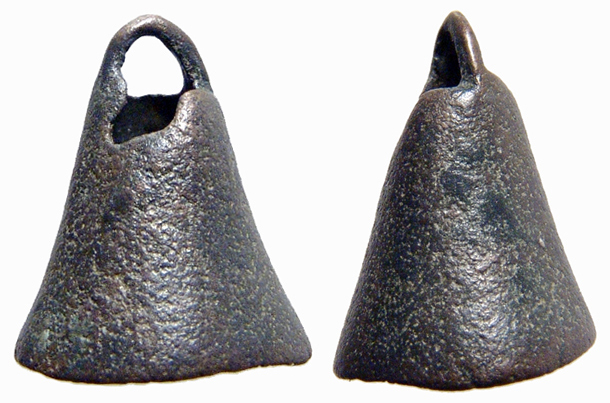 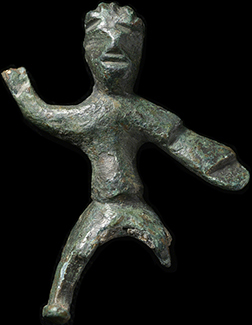 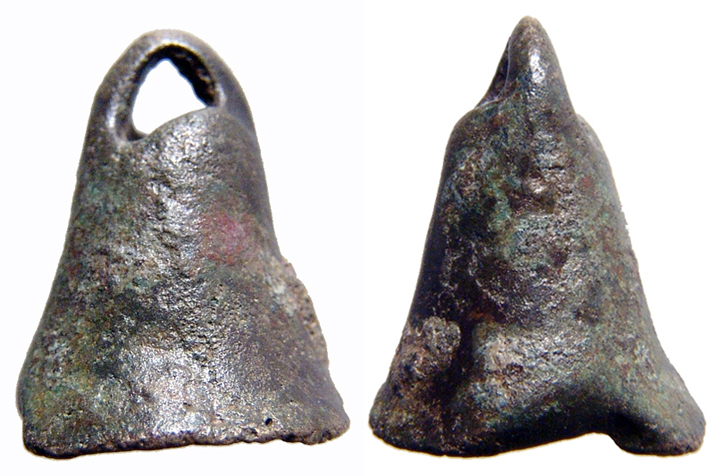 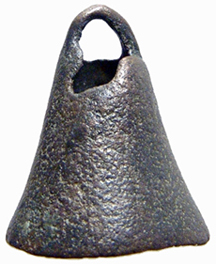 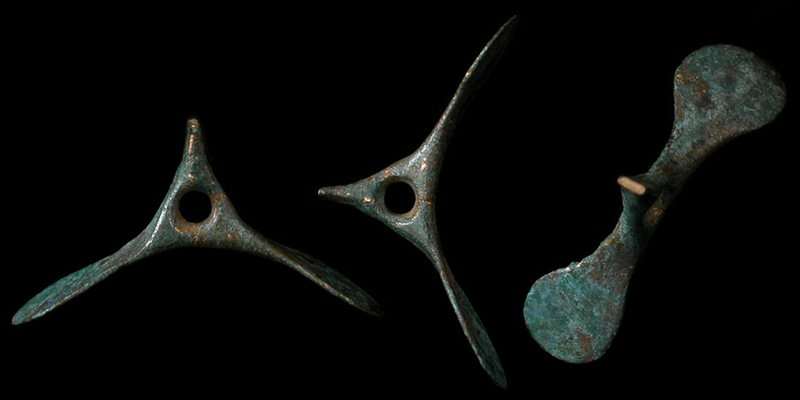 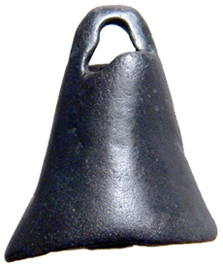 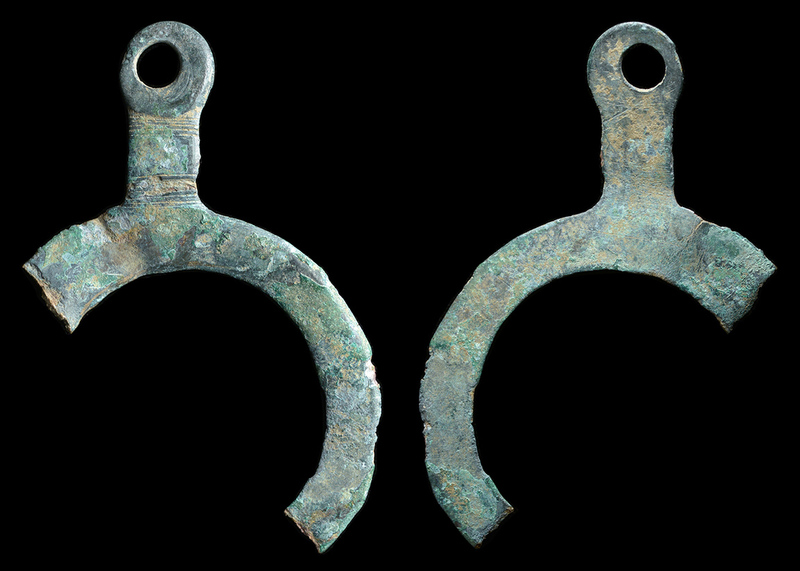 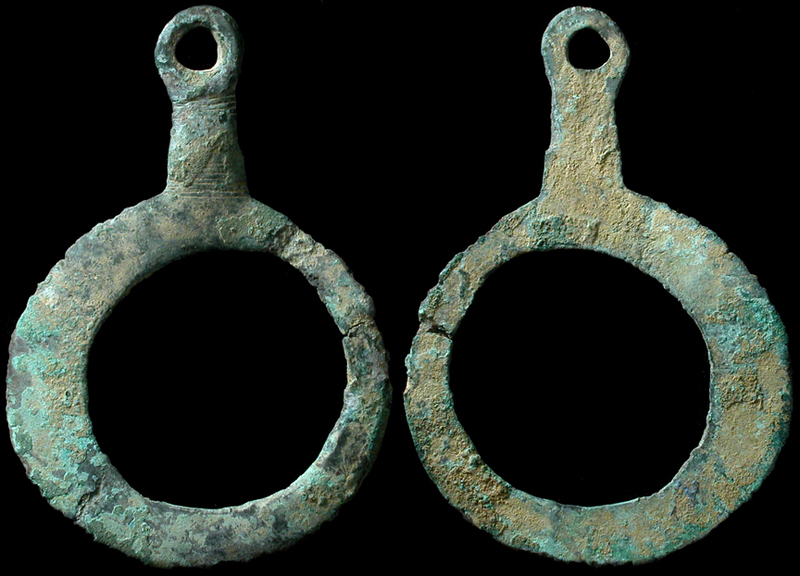 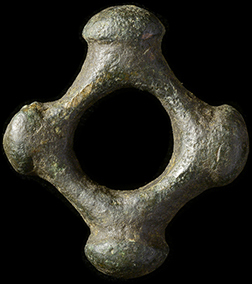 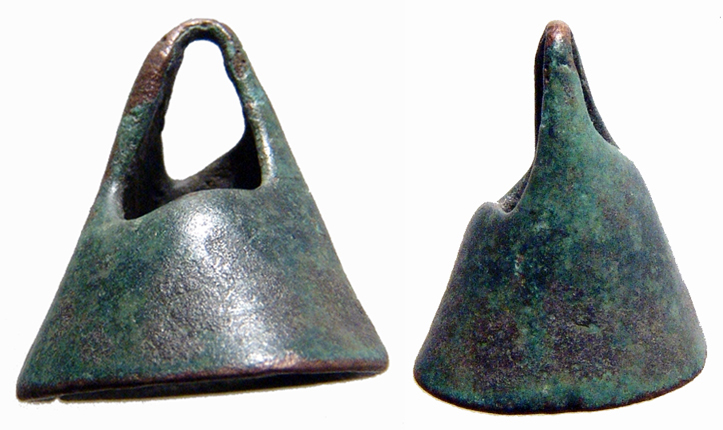 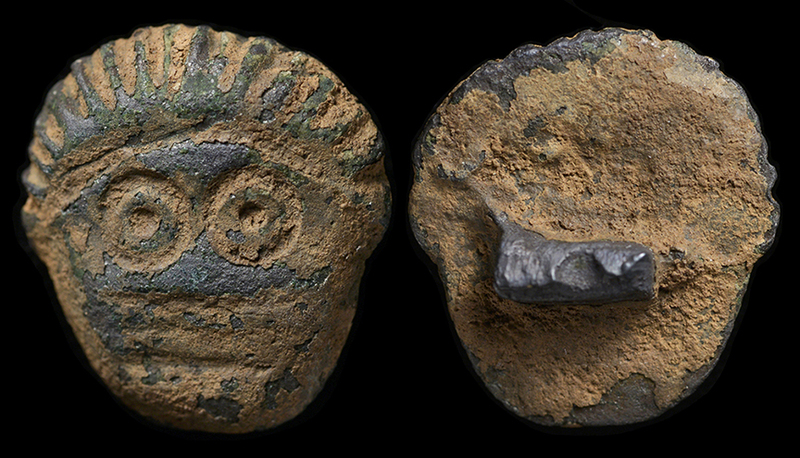 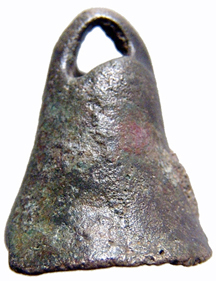 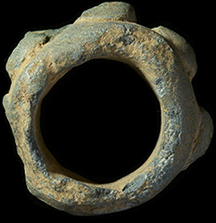 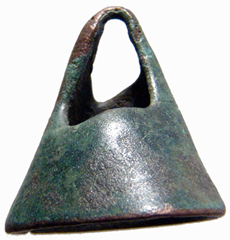 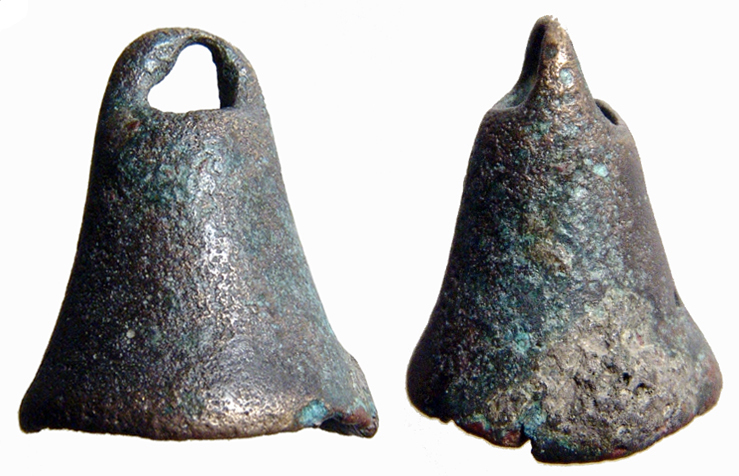 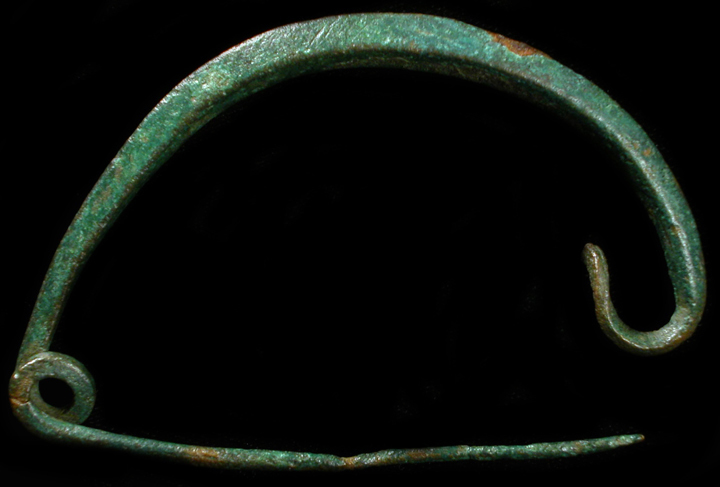 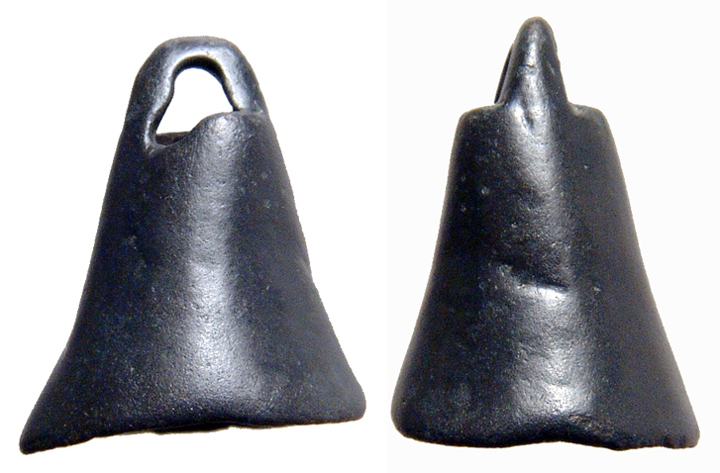 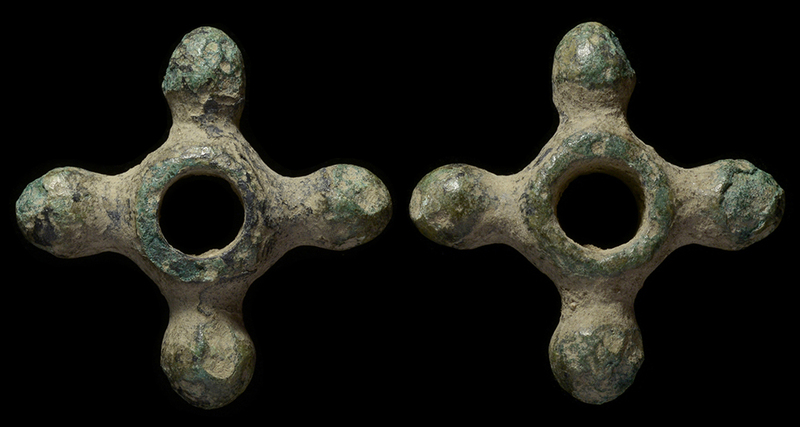 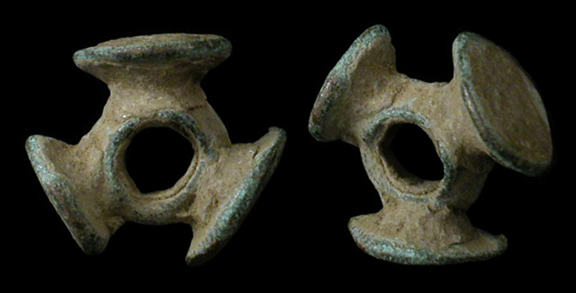 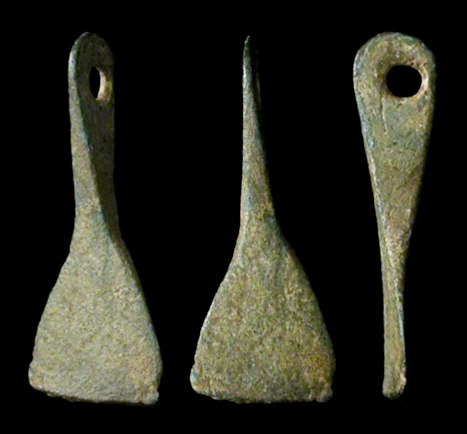 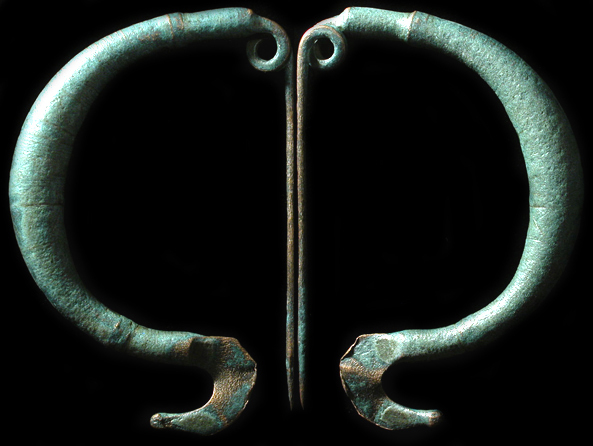 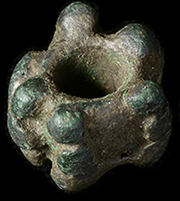 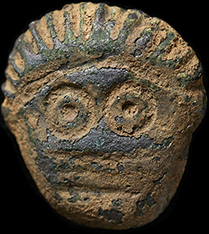 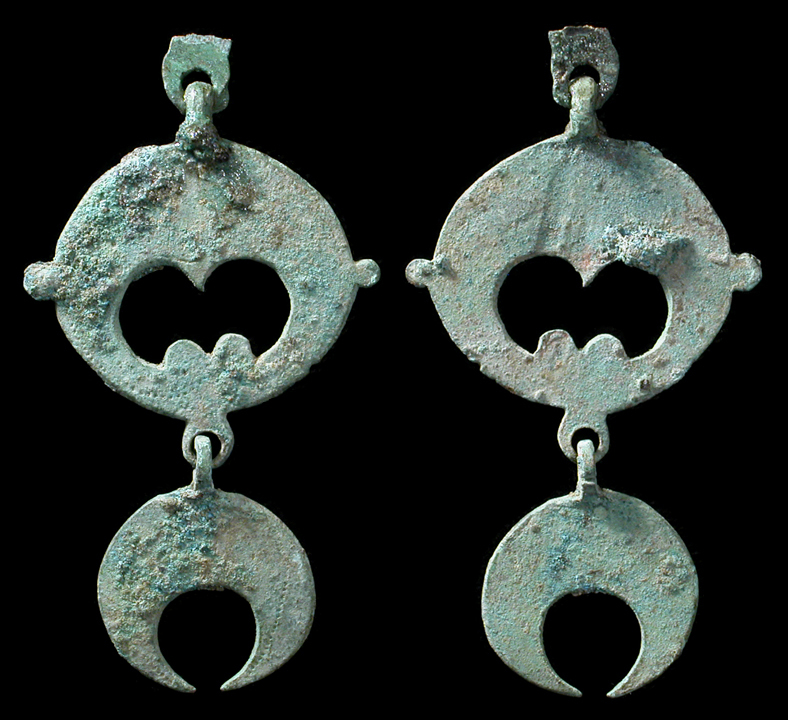 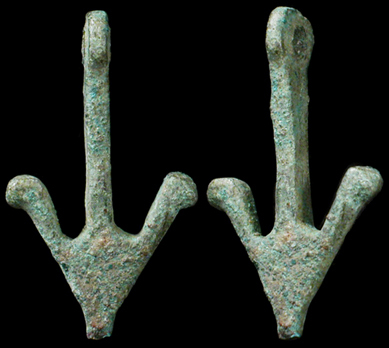 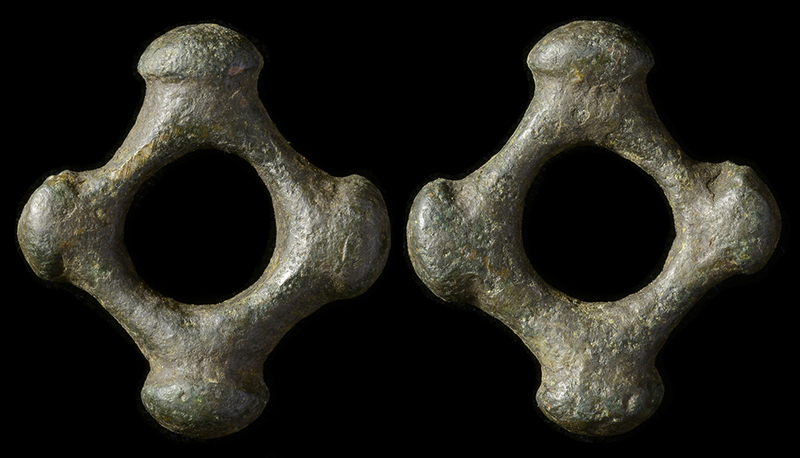 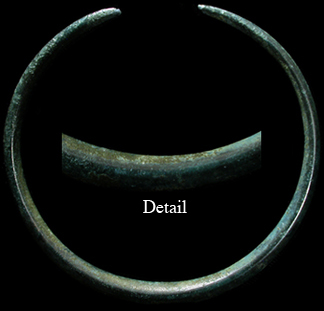 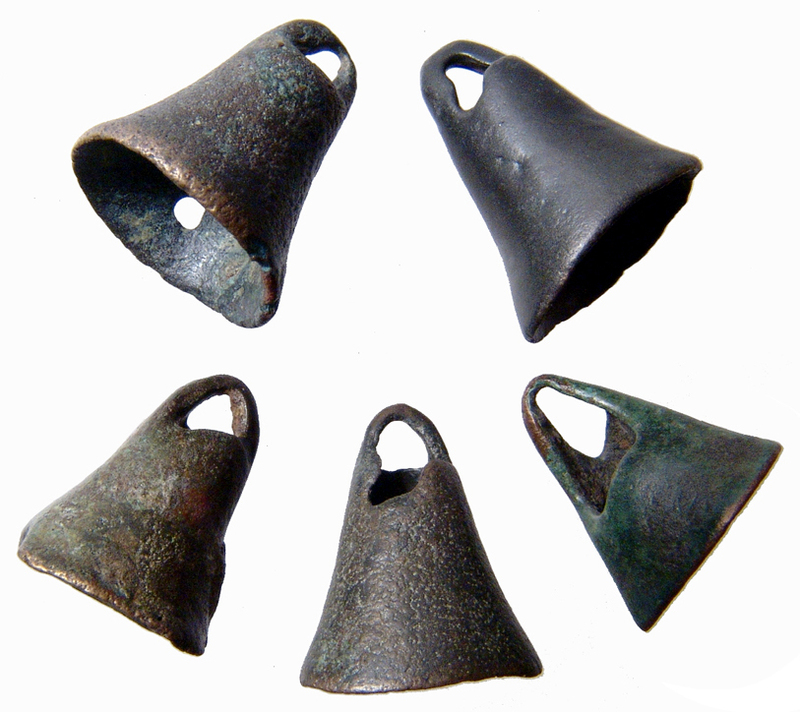 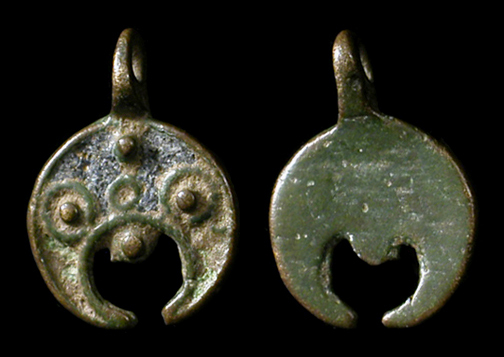 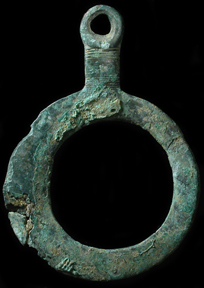 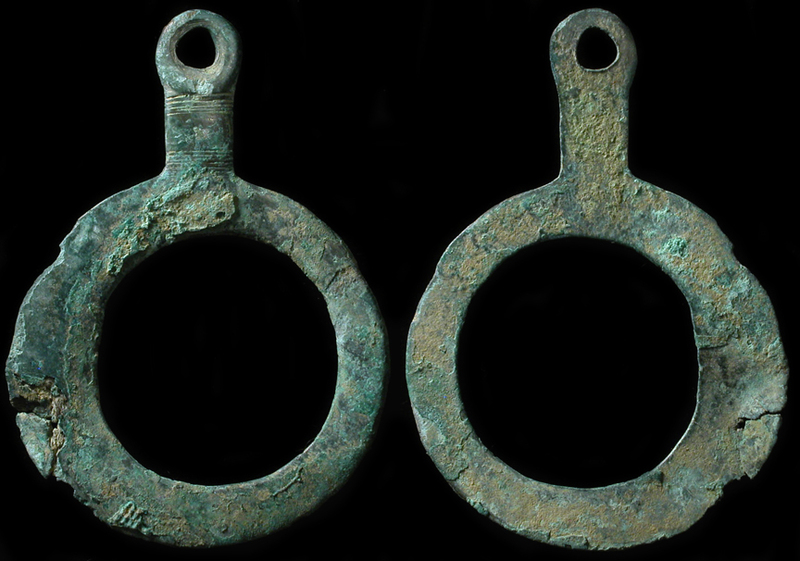 Ancient Celtic bronze "bell money", c. 5th-4th century BC. 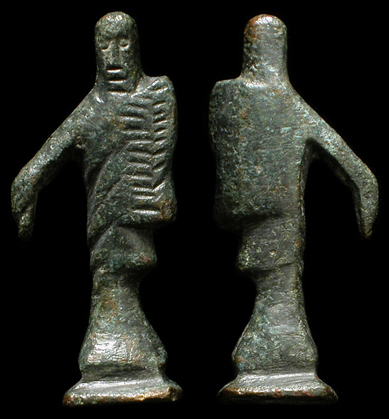 Danube River tribes. 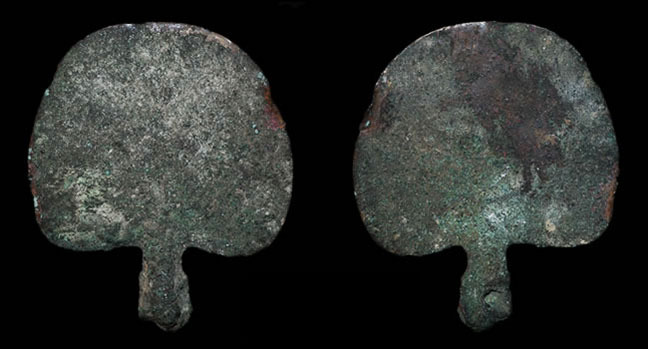 Used as currency, no clapper inside. 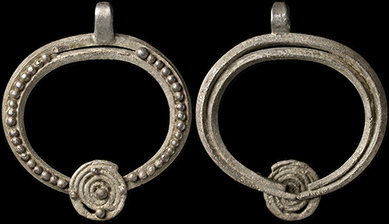 21 mm. 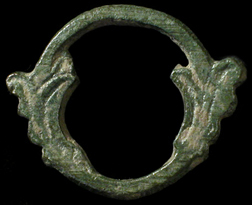 Celtic Ireland! 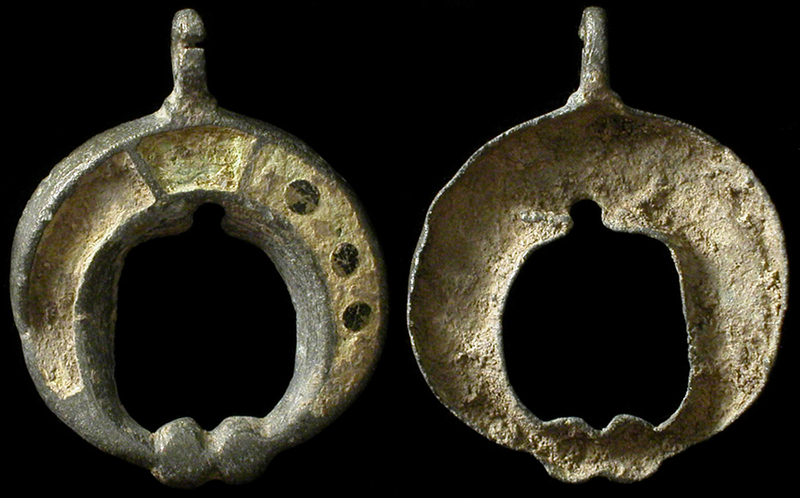 Amazing silver lunula (crescent) pendant, 5th-2nd century BC. 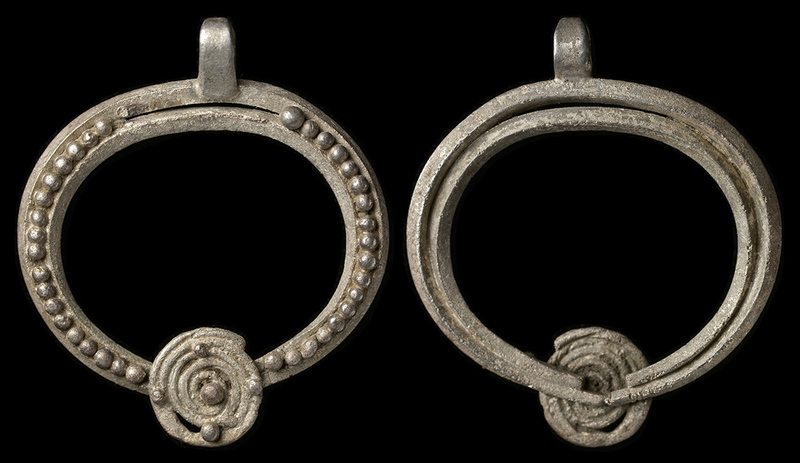 The lunula was a representation of the moon and variations have been recorded in finds all over Ireland. 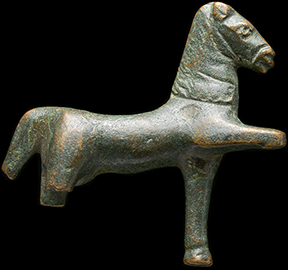 Many are held at the National Museum of Ireland and at the British Museum in London. 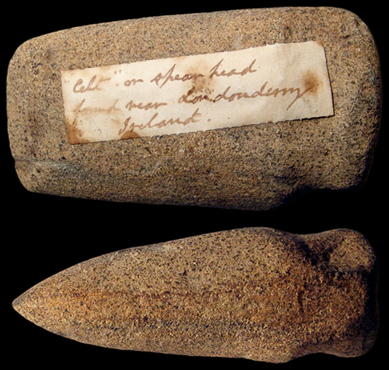 This specimen comes from a private German collection. 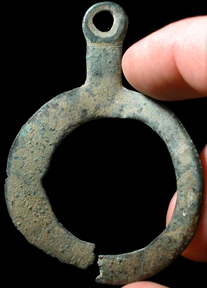 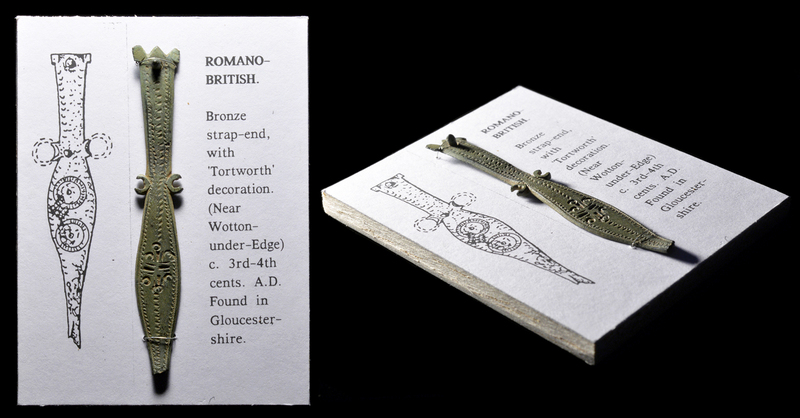 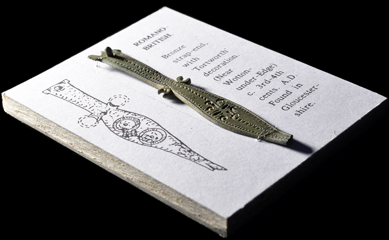 It was made of a hammered crescent-shaped sheet of silver and fastened with a single silver loop. 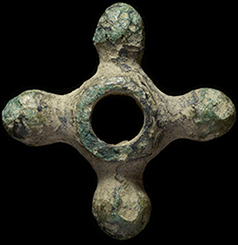 A beautiful little piece! 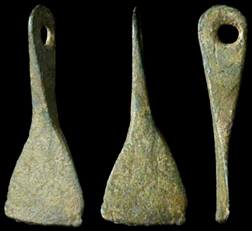 Measures 25x25 mm (1x1"). 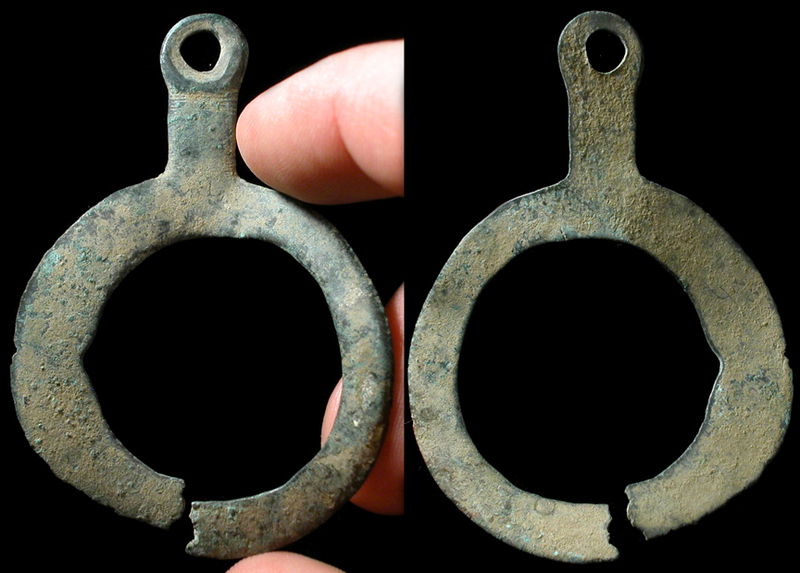 ref: G Coffey xxvii p252, Macalister pp31-33. 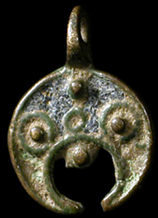 Celtic Gaul, c. 1st century BC. 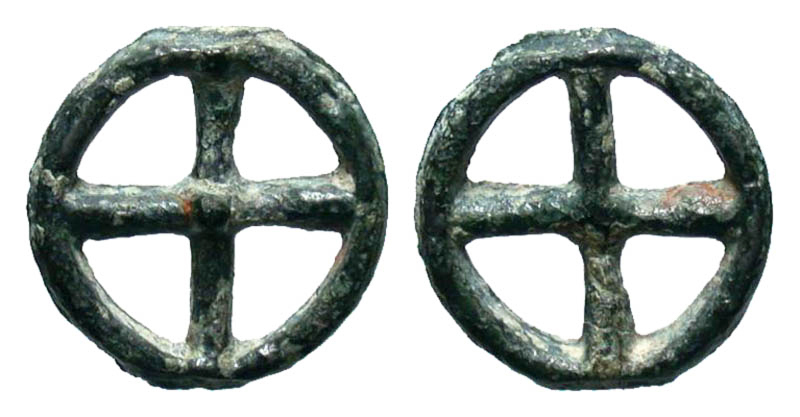 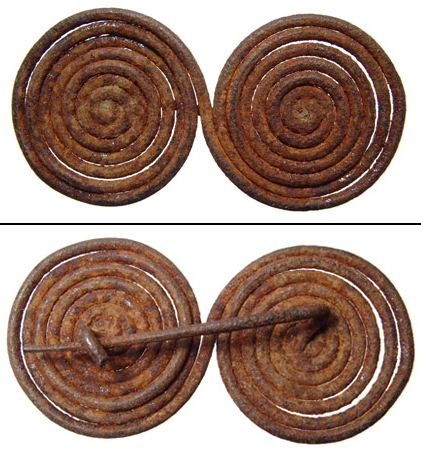 Bronze "wheel money". 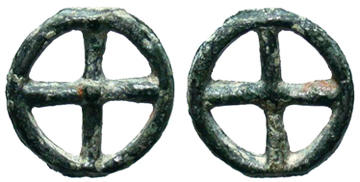 Four-spoked wheel. 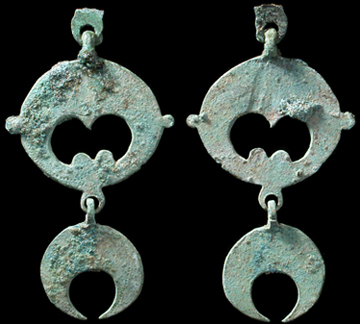 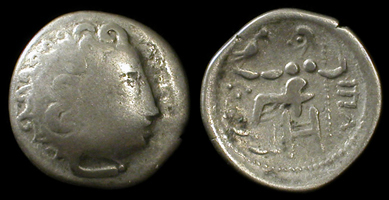 15.4 mm, 1.70 g. ref: Victoor IX-2b. 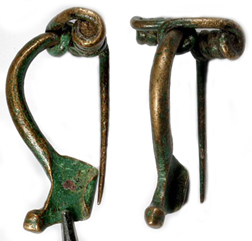 Ancient Celtic Shaving Razor! 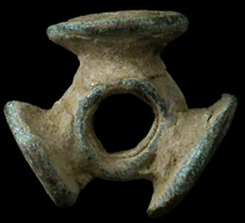 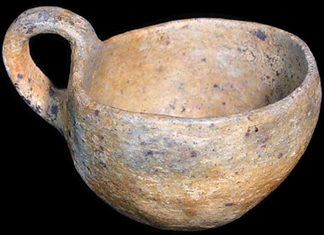 c. 8th-6th century BC. 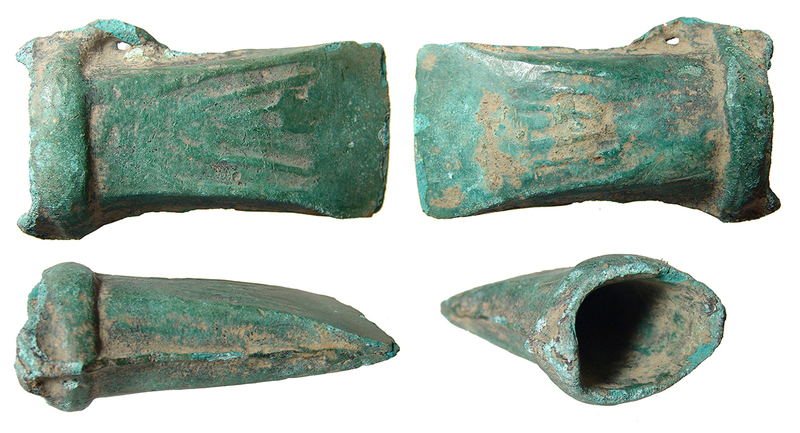 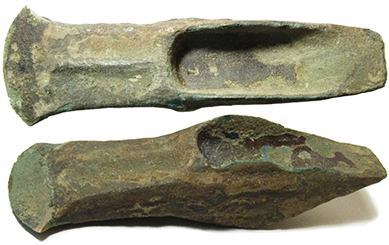 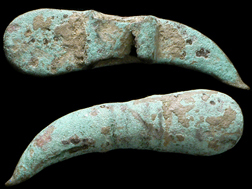 Rare Bronze Age 'Hallstatt Type' razor. 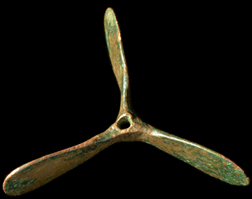 Rounded blade with wide shoulders, triangular-section rod handle pierced for suspension. 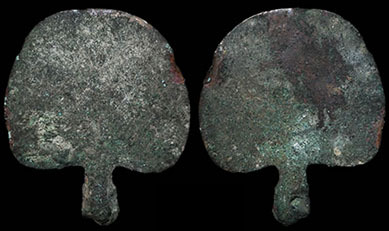 The rounded edges are worked to a very fine blade. 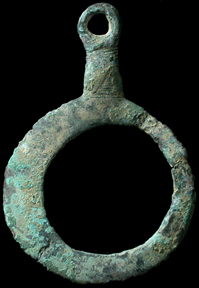 47x40 mm (1 7/8" x 1 9/16"). 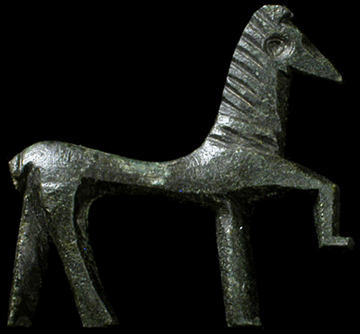 Reference: Murawski, P.G. 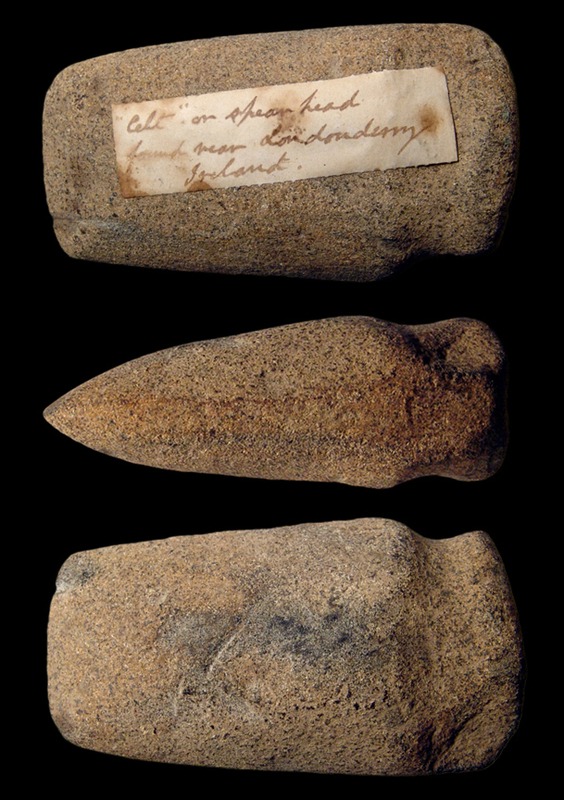 Benet's Artefacts of England and the United Kingdom, Ely, 2003 p.47 item B14-0603. 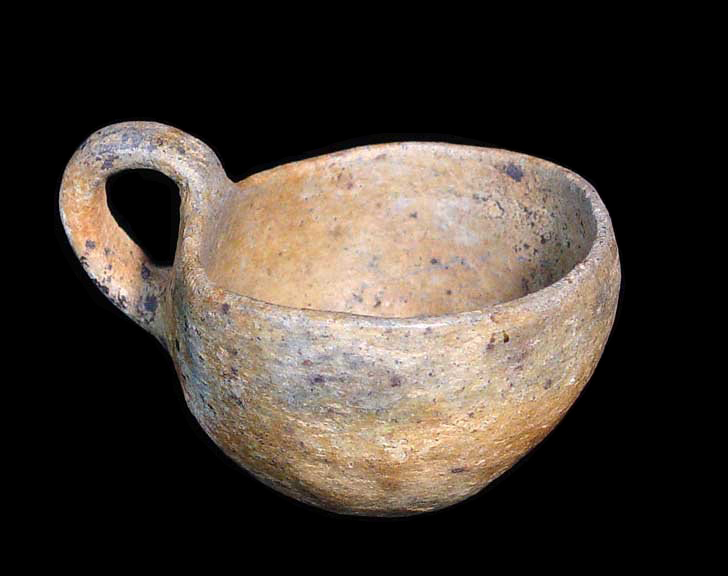 Very fine condition, olive-green patina with earthen deposits. 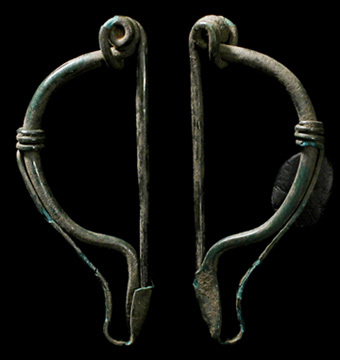 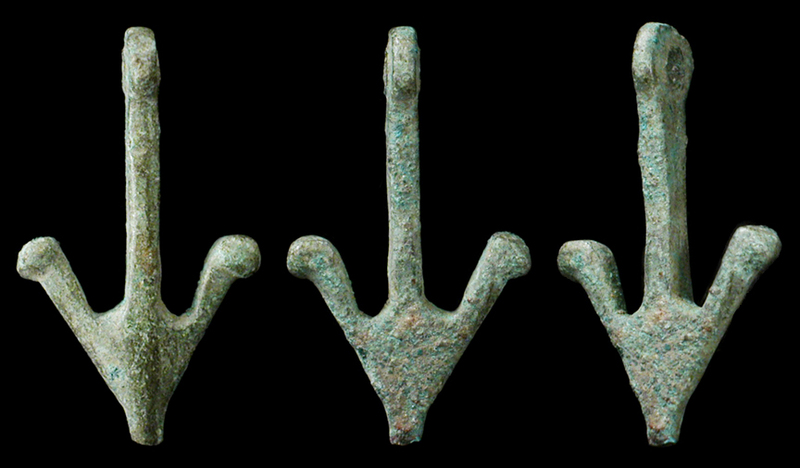 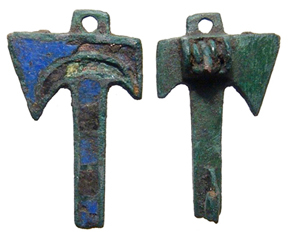 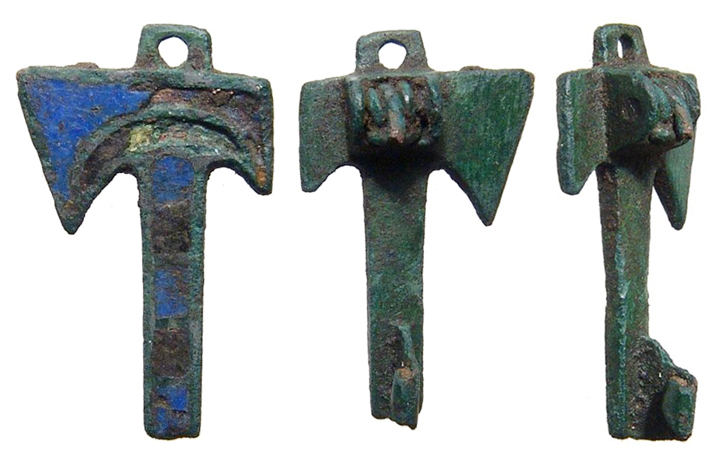 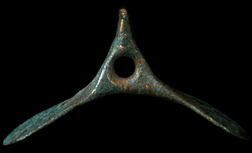 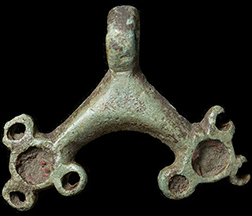 Celtic bronze "arrow" pendant, 5th-2nd century BC.